If you have trouble hearing high pitches, you may have high-frequency hearing loss. High-frequency hearing loss is becoming more and more common among Americans. In fact, 15% of Americans from the ages of 20 to 69 experience high-frequency hearing loss because of their own actions. And since it’s becoming so common, it’s more important than ever to arm yourself with information about this growing issue. High-frequency hearing loss can also be known as partial deafness. High frequency sounds like screams in a horror movie are registered through the bottom of the cochlea. If the hairs are limited or damaged in the cochlea, these types of sounds can sound distorted or muffled. 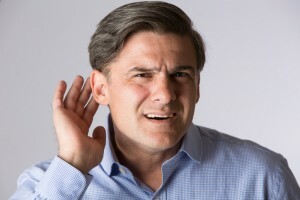 Interestingly enough, high-frequency hearing loss generally affects men more than it does women. One of the most common causes of this type of hearing loss is simply aging. As we get older, we lose more hair in the cochlea. But there are other causes, such as over exposure to loud sounds and head trauma. As we mentioned, more and more people are experiencing this type of hearing loss through their own actions. Listening to music too loud is a common culprit. There are medical reasons you could be losing your hearing as well, such as diabetes, inflammation of the middle ear, infection, and benign tumors. Hearing loss may be unavoidable as we age, but there are certain steps to take to protect your hearing. If you have to shout over noise or feel ringing in your ears, you are in an environment that is detrimental to your hearing. If you can wear hearing aids or limit to your exposure to these types of situations, you can help limit your exposure to some of the causes of hearing loss. Because of advancement in technology, there is a set of growing solutions for individuals who experience high-frequency hearing loss. If you can’t be helped by a hearing aid, one example to help improve your hearing is electro-acoustic implants. The implants are placed inside your ear. When the implant is inside the ear, external sound will be converted into electrical energy that is sent into an electrode in the cochlea. The acoustic prompts and electrical prompts are then sent to the brain, making sound easier to comprehend. This entry was posted on Friday, June 3rd, 2016 at 2:24 pm. Both comments and pings are currently closed.